Big news this week is the release of WordPress 2.7, therefore I have a selection of my favourite WordPress related links that outline both the new features of 2.7 as well as some development tips to help you make the most out of this awesome package. 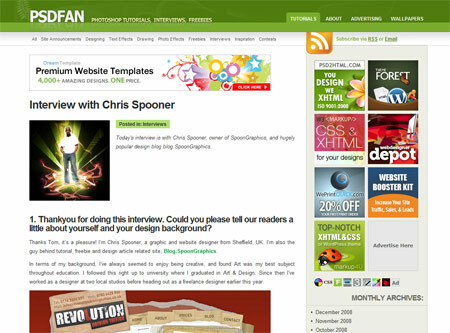 Other featured links include roundups of some great looking portfolio sites and a look back at two interviews I had the pleasure of being involved with. After the long build up, WordPress 2.7 was released yesterday. 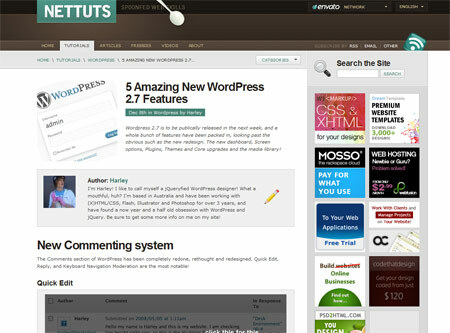 If you've been living in a cave over the past few weeks or months, check out Nettuts‘ detailed look at the new features that the new release brings to the blogging table. 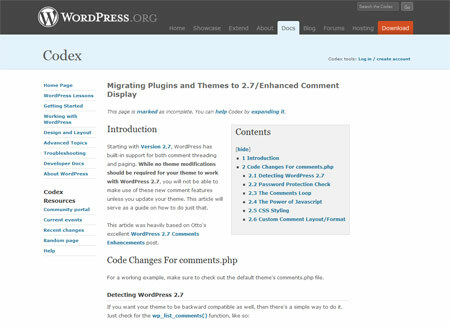 One big feature of WordPress 2.7 that requires some additional theming knowledge is the introduction of threaded and paginated comments. Thankfully the WordPress Codex has this interesting article outlining the new code snippets and how they are implemented in the new theme files. 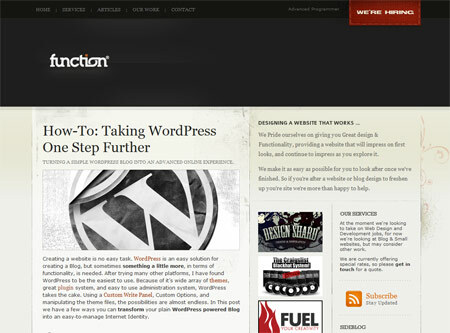 One final WordPress link I particular enjoyed reading was from Function. The article titled Taking WordPress One Step Further covers some of the advanced capabilities of WordPress that allow you to customise the underlying blogging platform into a versatile website framework. 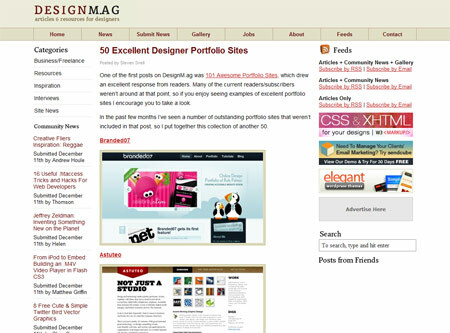 The post includes an array of code snippets that are particularly useful to have bookmarked for future theme creations. 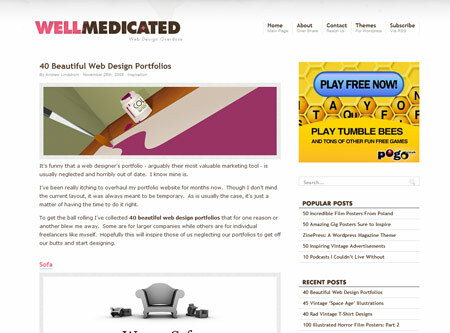 I'm always a fan of roundup posts, recently website design portfolios seem to be a popular topic choice with two excellent roundups from Well Medicated and Designm.ag. Each post showcases a collection of nicely designed websites for a dose of creative inspiration. 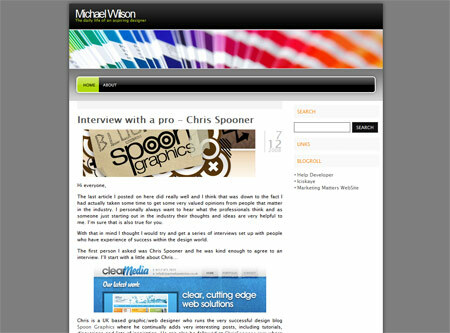 I also had the pleasure of being personally featured on a couple of sites this week, namely tutorial and freebie site PSDFan and the personal blog of Michael Wilson. I was more than happy to jot down my ramblings to their questions and hope the insight into my design life proves interesting! Thanks again guys! Well..i have also upgraded my blog to WordPress 2.7…do check out my blog for more love tips…..
Wow there are some really good wordpress designs. I have downloaded the new version of wordpress and although I like the new interface and design it breaks my website so I am going to have to look into that. Thanks for the roundup, I know I was excited about Word Press 2.7. It looks like an early Christmas gift. Very nice post, I totally love new wordpress managment administration panel – and thanks for the links to check out all new features! Hey, the blog is different today…. Excellent web pages Successes and prosperity to you! Great list. I like the design of wellmedicated, very clean!